The Mustang News celebrated 100 years of publishing the campus newspaper in 2016! Kennedy Library worked in collaboration with the Journalism Department, the Graphic Communication Department, and the Mustang News, CPTV, and KCPR, to celebrate the centennial in the Fall of 2016. We’ve digitized the student newspaper from 1916 to 2011. Browse or search by keyword here. We’re digitizing photos and audio from University Archives that capture student journalism, printing, graphic communication, and related clubs and departments. We’re archiving Cal Poly journalism on the web using Archive-It. We’re posting interesting stories to Facebook as part of our #CPMustangMonday campaign. 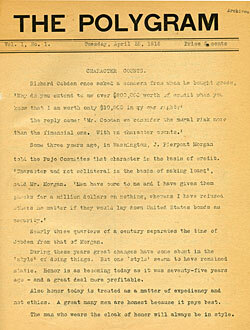 Front page of the first issue of the Cal Poly student newspaper, April 25, 1916. In 1932-33, a drastic reorganization of the Cal Poly School closed the high school, the junior college and related programs. The Polygram vanished in the wake of this reorganization. After a six-year hiatus, campus news found a new vehicle in a weekly paper, El Mustang. As was its predecessor, El Mustang was printed by the student body. A change in title to the Polytechnic Californian was attempted but lasted only a year, after which El Mustang returned to the masthead. During WWII, to economize on manpower and supplies, Cal Poly temporarily replaced El Mustang and the yearbook, El Rodeo, with a monthly news magazine, Mustang Roundup. El Mustang returned shortly after the war, and in 1967 became the Mustang Daily. The Mustang Daily continues to be published and printed by students in the Journalism and Graphic Communications Departments of Cal Poly, San Luis Obispo. Issued daily during the academic year, the Mustang Daily limits publication during the summer quarter to a weekly edition. The Mustang Daily averages about 140 issues per year, not including special editions for annual events such as the Week of Welcome, Homecoming, and Open House. In the Fall Quarter of 2013, the Mustang Daily became the Mustang News. The campus newspapers cover a broad range of topics from campus events, policies, issues and debates; arts and entertainment; athletics; local news and issues; and occasionally, national and international news. More recently, original articles are interspersed with articles from the Associated Press and the University Wire. Letters to the editor and opinion pieces reveal a wide and involved readership, not limited to the campus but extending throughout the county of San Luis Obispo and beyond. Photos and cartoons were introduced in the later years of The Polygram, and have been a regular feature of El Mustang and the Mustang Daily. University Archives contains a full run of the campus newspapers. Indexes and microfilm copies of The Polygram, El Mustang and Mustang Daily are available for use in the Special Collections and Archives reading room. Since Fall 2015, the student newspaper collection is digitally available at DigitalCommons@CalPoly. Yippie, Monday! It's 12:57pm right now.